SWM DUAL-SPORT BIKES HAVE LANDED IN THE U.S. The guys at SWM Motorcycles have informed us that the first shipment of SWM RS500R Dual-Sport bikies have arrived. After almost three years of dealing with EPA and CARB, the bikes are finally certified and street-legal. We have been hearing about SWM resurrection and modernization of what used to be the Husqvarna plant in Varese, Italy. That factory was abandoned by the new owners when KTM purchased the Husqvarna brand, and since then, SWM has taken over many of the original Husky models. In other parts of the world, the SWM brand has made a significant impact, but bureaucratic hurtles have slowed the process in the U.S. The RS500R is now legal and will have a retail price of $7795. 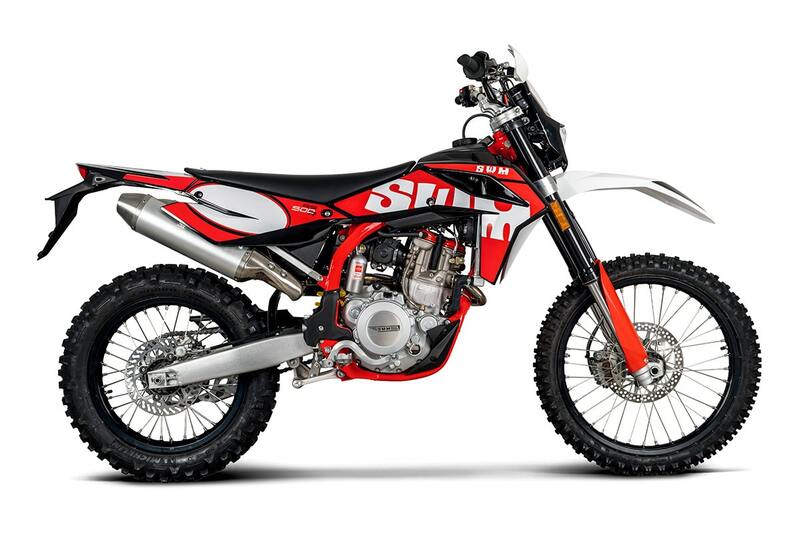 A Supermoto version called the SM500 will sell for $8495. Pete at Motoman is currently setting up a dealer network. Give him a call if you are interested. For a little more info on SWM dual-sport bikes, check out the Friday Wrap-Up this week.